Constellation wields the potential cosmic power to bend and manipulate light. She can also potentially invert light giving her the ability to travel across the spacetime continuum. She exudes an immense amount of energy. 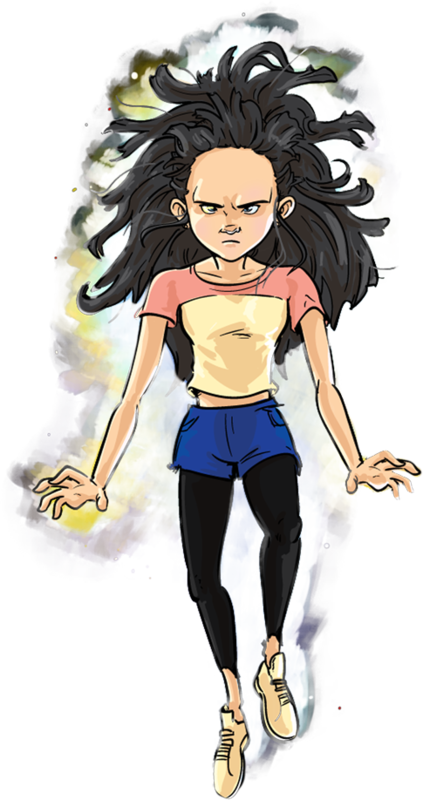 Her powers continue to grow exponentially as she matures. My name is Angel Wraith. And I am the new commander of the Starship Stratalight. This is an excerpt from my official log. After more than 10 days trapped here on the surface of this monstrous planet, we finally encountered a benevolent intelligent being. A child – a little girl to be exact. She came to us in an extraordinary way during a battle in which we were able to not only seemingly wound the planet, but also potentially find a way off its surface. Her name is Constellation and we would eventually find out that she had come into existence through the actions of a pair of hyper-beings by the name of Byron Jones and Lacey Meadows, also known as Shuttershock and Lightrider respectively. I knew the names from Captain Noble’s past journals, especially Shuttershock, who worked closely with Noble for several months during a series of insane adventures as they tracked, among others, the international arms dealer Ramses Hondo, who of course turned out to be an earthly liaison for the Tromokratesian warlord Emperor Kako. Though the little girl seemed to be no older than 4 or 5 years old when we found her, she speaks with the knowledge of someone who’s been around for hundreds of years. She told us that Shuttershock and Lightrider had spent many months trying to figure out how to be in each other’s presence without destroying one another, for Lacey had became a being of pure living light and Byron became a living black hole – two catastrophically diametric phenomena. The pair finally found their sanctuary within a Dyson Sphere – an insanely powerful sphere of energy that encompasses a megastar and absorbs most or all of its power output. It is an extremely rare occurrence and the energy sphere has been believed to be virtually impenetrable. Apparently, Shuttershock and Lightrider were able to get inside – and once there, they were able to touch for the first time since they’d gained their hyper-abilities. To hear Constellation describe it, their long delayed reunion was a thing of immense beauty. But also, it was a thing of immense cosmic power, as the combination of the Dyson Sphere, the mega star and the explosive energy produced from a living black hole and living concentrated light uniting, created the perfect conditions for an Everlife to come into existence. The Dyson Sphere served as a celestial womb for the development and eventual birth of Constellation’s physical form, and apparently Shuttershock and Lightrider did not notice what their eternal connection had done. What they did notice was when the megastar, and thus the entire Dyson Sphere began to suddenly travel at the speed of light. They were able to pull away from it, thus forcing them to distance themselves from one another once again, but the sphere itself continued its journey straight toward us on the monstrous planet! You see, our navigator, the immortal Marco Crux, possesses the power to sense the location of stars and manipulate their movement. So, in an effort to battle back against the living planet that has thus far been responsible for the disappearance of our engineer Smolder, the deaths of our leader Captain Noble and lead pilot Aphelion, the loss of Euphoria’s powers, countless physical injuries and a bevy of psychological scars, Crux pulled stars from the cosmos and set them on a collision course with the monstrous planet. As hundreds of celestial fireballs rained from the sky and covered the surface with massive explosions we could actually hear cries of pain. Placebo, our telepathic communications officer, was also able to sense violent psionic surges, signifying Crux was indeed making an impact. Of course there was an insane counterattack, as our surroundings and the planet’s elements attempted to tear us and the Stratalight apart. Our science officer Wavelength, with his ability to sense atmospheric variations, realized that for the first time the dense air and gravity fluctuations that had kept us from obtaining escape velocity were breaking. He communicated as much to the rest of us and I gave the order to board the ship. But our mechanic Powerline refused to obey, as he was determined to remain on the planet until we either found Smolder alive or confirmed his death. Wavelength and our security manager Chief Two Strike attempted to force him onto the ship, but Marco Crux jumped to his defense. I sympathized with Crux and Powerline, but at that point my goal was to get as many of us off the planet alive as possible. I ordered Placebo to knock them out with a mental blast. But she could not comply as it seemed the planet had launched a direct psionic attack against her. A few moments later I awoke. The air was calm. Hundreds of charred creature corpses were strewn about. Several other members of the Stratalight had been knocked unconscious, but luckily my force field had held and no one had suffered any further severe injuries. As the smoke cleared I turned to see Marco Crux and Placebo standing about a hundred yards away from Ship. Doctor Robotica tended to the other crew members and I flew over to see what the two of them were looking at. They were actually standing at the edge of a crater the size of the Grand Canyon caused by the impact of the Dyson Sphere megastar. Marco Crux suddenly took off and dove down into the crater. A few moments later he returned, and hovering alongside him was the little girl, Constellation. We took her back to the ship and Doctor Robotica checked her out. She was of course beyond healthy, as the explanation of her creation made it clear to us that she was not an ordinary human. Marco Crux was also easily able to detect the celestial energy flowing through the young one. At this point, however it is difficult to gage the extent of her power as her abilities are relative to her size and age. In other words, she’s yet to fully mature. And that’s despite her accelerated growth rate; it’s only been a couple of hours since we found her and she’s already gone from the size of a 4 year old to that of about a seven year-old. She has also become exponentially more verbal – hence the story of her creation and the mention of the names Shuttershock and Lightrider. However, she has now mentioned another name I recognize from the journal of Captain Noble – the Zhibdean Master called Hosho. Noble, along with Shuttershock, had come into contact with Hosho during the mission to bring down Ramses and, at that time, the Zhibdean Master had warned of the coming evil that was Emperor Kako. Fortunately the warning was a key element in helping to mobilize the heroes and armies of earth, which is why we were prepared to hold off the Tromokrateisans and keep Kako from getting the third triplos asteri and in turn stop him from becoming god of the universe alongside Armonia. Constellation however is insisting that we take her to Earth so that she can meet Hosho herself. Marco remarks that if she is a young Everlife, it is only right that she seek out an elder Everlife to help her find her way. But even if that’s the case we still must figure out a way to find Smolder and get out of this place. We expressed as much to the little girl, explaining our predicament to her, how we had crash landed, been constantly attacked by the planet’s creatures and elements, and come into contact with a powerful being called Ominous who told us that the planet was alive and actively trying to make us all dead. Constellation however seemed unmoved by our tales of woe. She simply said that as long as we have the Chess Master the Stratalight has a great chance of making it off the planet. The others looked confused, but I immediately turned in the direction of our communications officer. And at that point, it was beginning to become clear: Placebo not only knows what’s happening to us, she may actually be the one responsible for it.